Thought I would update on the last few weeks of summer, that is before all my waking hours were devoted to the joys of sorority recruitment, but that is for another blog post. After a tearful goodbye at the John Wayne International Airport in Santa Ana, California, I landed safely in Kansas and began work on my "room remodel." My room was a delightful shade of "coming up roses" pink, which I carefully selected at the ripe age of twelve and a half, for my new "mature" room. I picked out a pottery barn teen bedspread and thought I was "oh-so-mature". Well, that bright pink room got me through middle school, highschool and even a college summer or two, but with a few spare weeks of time, I decided it might be time for another update, this one to transition with me from college to student teaching and eventually (say-it=ain't-so) the Pennington's guest bedroom. Anywho, I picked out a delightful hue of "Aspen Gray" and went to work. 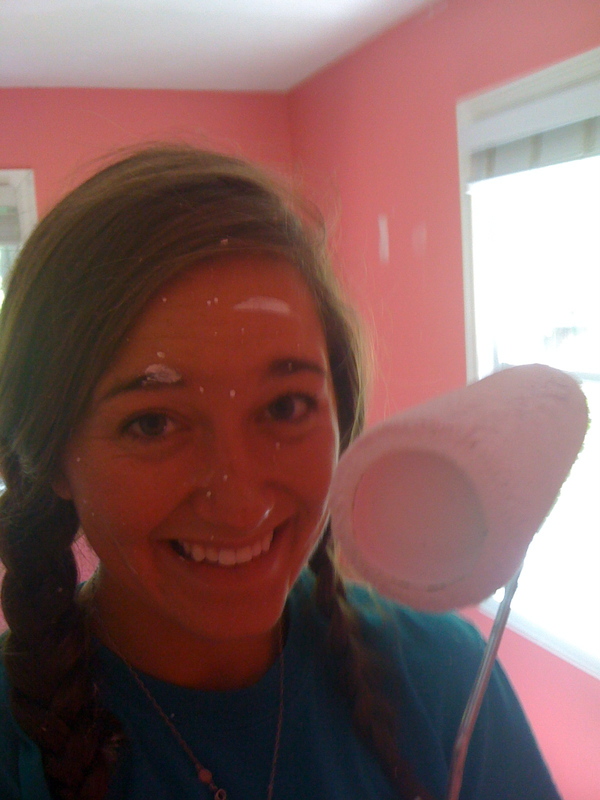 Naturally Dad told me I needed to paint the ceiling first, and paint I did. My room is not very big, but in those few hours of painting the purple--->white ceiling paint, my neck was stiff and I was covered in paint droplets. I sure felt bad for poor Michelangelo for the 4+ years he spent painstakingly painting the 12,000 square feet Sistine Chapel. Yikes! I took a break from my "remodel" when my dear sweet friend Hollie came into town and we had ourselves a little girls weekend. This weekend consisted of: forcing Hollie to help me scrape a layer of crappy varnish off what turned out to be beautiful hardwood floors I unearthed from years of stained carpet. I handed her a tool within an hour of her arrival and said, okay I wanna hear about your summer--lets talk and scrape! My friends and I also went to the KC Bridal Fair, though none of us are engaged, we did get to make up fake wedding dates, sample yummy cake and pretend Chelsea and I's fake fiances were best friends and it was "SOOOoooOOoooOoo fun to be planning our wedding together" It was hysterical. We totally fooled the gay photographer we were talking to, as he exclaimed in delight "best friends engaged to best friends" we almost burst out laughing. We went out for Mexican Food, ate tons of chips and salsa, visited the city market area of KC and watched a beautiful sunset. Basically our time was filled with gab and gossip, catching up, laughter and food. I am blessed with the greatest friends in the world! 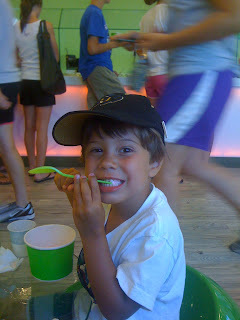 The last week of summer before crazy rush/workweek I got to spend nannying for the three crazy Hartman Kiddos. It was a nice change of pace, being back in a routine and taking care of three little ones. They kept me busy and it gave me less time to think about missing Johnny, a welcome break from the hours of sappy alone-time I had with my own thoughts while painting, scraping and organizing. We went to the pool, saw the movie "Beezus and Ramona" frequented sonic for slushies at happy hour and even squeezed in making homemade breadsticks and an art project or two! Tune in next time for stories from Rush/Workweek, and pics too!